WW2 RAF pilot Peter Carter should have died that night. As his burnt up Lancaster bomber plummeted to its end over the English Channel, the rest of the crew had either bailed or died and with a broken parachute he had no chance of survival. He radioed into June, an American operator, with his final status. Perhaps they had fallen in love during that brief conversation? And then in a dashing gesture, he jumped from his plane to his certain death. 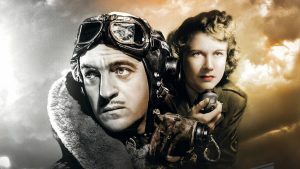 And that may sound like a spoiler but it’s just the start of this classic Powell and Pressburger fantasy-romance starring David Niven and Kim Hunter. It’s just as relevant today with its themes of love, death, the afterlife and Anglo-American relations, as it was in 1946 when the film was first released and tapped into so many people’s experience of lost loved ones during the war.